A Mexican woman who falsely claimed to be a U.S. citizen nearly a decade ago is barred from ever entering this country, despite her marriage on Tuesday to an American living in El Paso. It's a rule one Texas congressman hopes to change. PASO DEL NORTE BRIDGE — The inches Maricruz Valtierra Zuniga stood from the United States border on Tuesday morning could be as close as the new bride ever gets to this country. 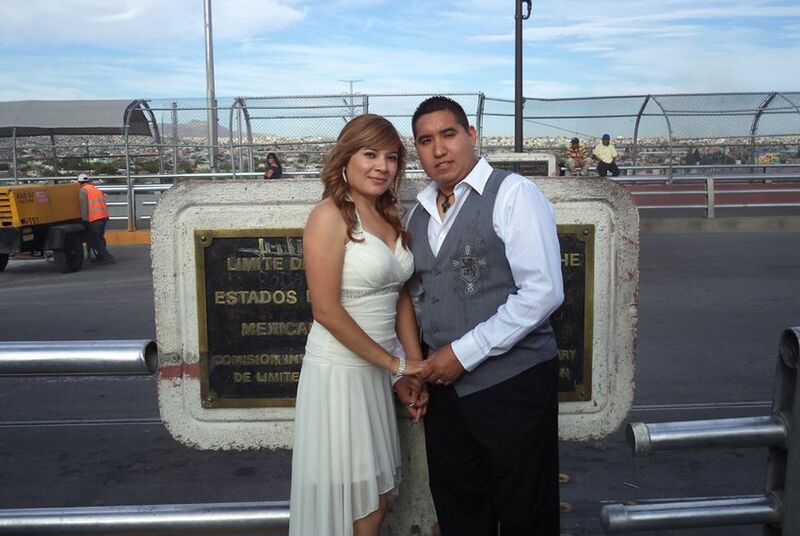 In a wedding ceremony atop the international bridge, witnessed by family members, a U.S. congressman and Customs and Border Protection agents, Valtierra, a 25-year-old from Mexico, married her longtime boyfriend, Edgar Falcon, 27, a U.S. citizen who calls El Paso home. A mistake authorities say Valtierra made when she was a teenager — falsely claiming to be a U.S. citizen — means she is barred from ever entering this country, or establishing a life here with her husband. A 1996 immigration bill signed by then-President Bill Clinton made falsely claiming U.S. citizenship an offense so serious that it barred offenders from ever reentering the country. Falcon said that in 2005, when oral declarations of citizenship were still common, Valtierra's older sister incorrectly claimed that the siblings were U.S. citizens. Falcon said he and his fiancee did not realize how dire the situation was until they decided to get married and visited the U.S. Consulate in Ciudad Juárez. Tuesday’s nuptials on the bridge connecting the sister cities was by all accounts a publicity stunt. But Falcon said they did it to send a message. About a year and a half ago, Falcon reached out to American Families United (AFU), a pro-immigration reform organization that concentrates specifically on the complexities of marriage and immigration. The group has worked with U.S. Rep. Beto O’Rouke, D-El Paso, who was on hand Tuesday morning to witness the ceremony, give the newlyweds a wedding gift, and discuss legislation he intends to file to address Falcon and Valtierra’s unique situation. O’Rourke said the American Families United Act would allow Department of Homeland Security officials or U.S. immigration judges the discretion to determine the outcome in deportation or inadmissibility proceedings when a person is an immediate family member of a U.S. citizen. It would also establish waivers under which certain applicants — including those with a history of misrepresenting their legal status — could reside in the U.S. while their applications are being reviewed. The congressman said he intends to file the legislation when members return next month after their August recess. It is unclear what path the proposed legislation will take, but O’Rourke acknowledged intense lobbying lay ahead. Republicans in the U.S. House have said they have no intention of tackling an omnibus immigration bill the way the Senate did. Instead, they say they will take a piecemeal approach and focus on security at the border first. The tone doesn’t appear ripe for compromise. Late last week, U.S. Rep. Bob Goodlatte, R-Va., the chairman of the powerful House Judiciary Committee, wrote Department of Homeland Security Secretary Janet Napolitano urging a review of the country’s process for accepting asylum seekers. The chairman argued that the system had been gamed after officials recorded a spike in the number of requests from Mexican nationals seeking protection from gangs, a so-called credible-fear claim. Two days later, the chairman issued a statement criticizing an Aug. 23 directive from the White House to Immigration and Customs Enforcement urging a review of deportation cases involving adults who are the primary caretakers of minors; parents or guardians involved in a family court proceeding; or parents or guardians of minor children who are citizens or permanent residents of the U.S.
O’Rourke said he wants to take a page from the GOP handbook and stress family unity. Bruce Morrison, AFU’s legislative director, said that under existing rules, Falcon is forced to choose between his love and his country.